Our 2008 Boston Whaler Outrage with Mercury 135 Verado has a small problem with steering. The starboard end cap on the steering cylinder is dripping just a little bit of fluid. I'm not the handiest guy, but I want to learn to fix these kinds of problems the best that I can to avoid the ludicrous labor fees from the local dealer. This is where I could use some help. I've inquired, and it seems the part is a Uflex UC128 cylinder. I've had a look at the steering rod, and it is nice and smooth: no abrasions, gashes, pitting, etc that I can see. I'm hoping that replacing the end caps is all that is needed. Are these cylinders difficult to remove? It appears I need a spanner wrench, but I can't find the one that fits online. Can someone point me to where I can purchase such a wrench? To replace the end caps, will I need to completely remove the whole unit from the motor, or can I take off the end caps while it's still connected? Finally, is replacing the seals and o-rings within the cylinder something I can do without special equipment? I imagine that replacing the seals would require complete removal of the cylinder. Please help me with this process. I'm trying to become more adept at this type of stuff. Thank you. Note that one of the kit suppliers is in Australia which may complicate a purchase. Do a search for "pin wrench" to find the wrench you will need. The wrenches I found were expensive. 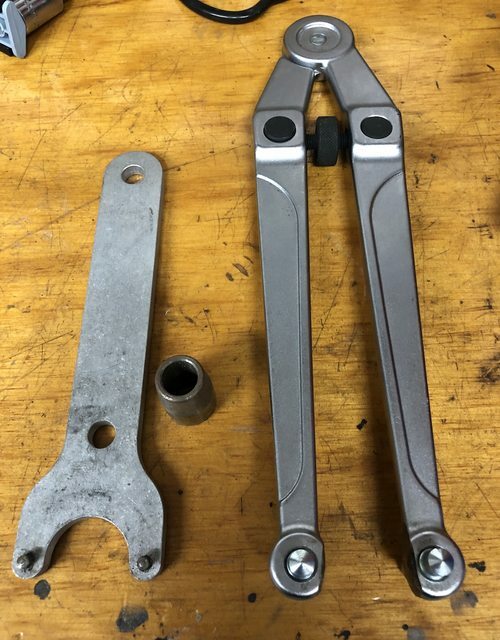 To order a wrench you will need the precise sizes (diameter) of the "wrenching holes" in the end caps and the "center-to center" distance between the holes. These are spanner wrenches and/or pin wrenches and are even sometimes called "spanner pin wrenches". They are a bit of a specialty item. I recommend you replace the seals in both ends. Doing the job yourself is a rewarding experience if a little challenging. The only benefit from doing it yourself is learning how to do it. If I have another seal failure I will remove the cylinder and have the seals replaced by a local hydraulic shop. The process is easy if everything comes apart without being corroded (salt water boaters). Personally, I think bleeding the lines is the biggest part of the job. Out of the parts you listed, you only need the end caps, since that's were the fluid is leaking. The easiest is to by the fully assembled cap, rather than trying to remove and seat the new seals. Dig around on the mfg website to see if they offer the wrench and also a bullet looking piece to protect the seal lip when installing the end cap. These are the tools I have for this process - 2 different pin wrenches (fixed and adjustable) and the seal install "bullet". Rather than duplicate instructions that already exist, take a look at this link for detail. The process for Teleflex and Uflex are similar. These are the instructions for the Teleflex seal kit. Different brand, but shows the overall similar process. Be advised the tools may not be the same size as listed. DT--very interesting tools you have there. I am always telling my wife, "A man can never have too many tools." The more unique the tool, the more fun to use it--once every ten years. When I was removing the end caps I was unable to exert enough force using the pin wrench by hand and had to use a hammer on the wrench to loosen the caps. A length of pipe over the wrench would probably have sufficed but working space is scarce in that area. I kept the tool but probably could never find it among all the junk I have been accumulating for six decades. We recently moved and as I continue to refine our storage area in the garage I keep finding things I have not touched in forty years or so. I'm beginning to get rid of some old stuff but it goes against my nature to give up anything that may be useful in the future regardless of how unlikely that may be.